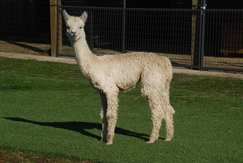 Sophora of Halo is a sweet and lustrous alpaca. She is sired by 4 x Judges Choice winner Chakotah's Wyuna. Sophora's full sister, Wyuna's White Diamond, is a 2 x Reserve Color Champion at IAO and has received many awards including the Bred and Owned show category. Sophora by comparison is the same if not more outstanding than her sister, with remarkable head coverage, a nice dense fleece and outstanding confirmation.